Jagannatha is worshippedas Daru ‘Brahma.’Daru in Sankrit, means wood or timber and Brahma means the all pervading soul, the universal life force, the God of gods. It has been said earlier that the idol of Jagannatha is made of a log of wood. 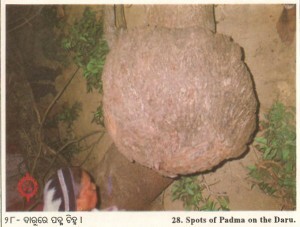 It is the margosa tree, the trunk of which is used to fabricate the body of Jagannatha. But it is not merely this log of wood or the image that is worshipped with so much of reverence. What is known as Brahma in Jagannatha is something unseen: that is there in his body. In that part of the log of wood which represents the substance of the image,there is a cavity wherein a casket containing something unknown has been kept.Thus, that Daru or the wooden imagecontaining this Brahma is called Daru Brahma. The Puri temple had been attacked many a time and the accounts may be read in the pages of history, The property of Jagannatha was looted. The images on most occasions were carried to distant places underground through forests. But the Brahma placed within the images remained untouched by the enemies and were thus saved from desecration. There are many theories about this unseen thing calledBrahma.Some say it is a tooth of Buddha. Others say, it is an image of Vishnu made of some precious Slone. Some others hold that it is a very rare variety of Salagrama Sila (a piece of stone generally black in color, worshipped as the representative image of Visnu). But the fourth view is very important. 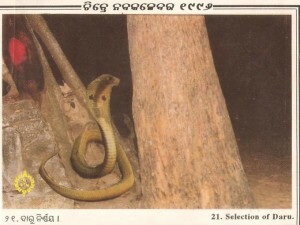 We are told on the basis of ,poetical works written in Orissa about five centuries ago, which again is based on popular traditions that a piece of the bone of Krisna incarnation, who was cremated by the Pandavas after he was killed by Jara Savara and some portions of whose body did not catch fire and therefore remained unburnt, is there in a casket in the body of Jagannatha. Those who want lo know more may contact the scholars on the subject.